Welcome to the Minnesota United States Pageants! United States National Pageants, Inc is the fastest growing pageant system in our nation today. Each year, ladies from across our nation make the decision to become part of the legacy that was established 30 years ago by Isabella Ilacqua. The primary goal of the Miss Minnesota United States Pageant is to provide a life-changing experience for the young ladies across our beautiful state of Minnesota. The organization strives to empower all delegates to become active participants in her community while nurturing and promoting a cause meaningful to her, through her platform. The Miss Minnesota United States Pageant is based on a solid commitment to uphold the standards of fairness and integrity. It prides itself in focusing on each and every lady who chooses to compete in this pageant system. ?The pageant and program is all "ABOUT THE CONTESTANTS" because without contestants, there is no pageant! And there is no program!! It is our goal to provide a fun and educational experience that each contestant will remember and cherish for years to come! The pageant system allows young women from all over our state to interact and discuss their achievements ?in service and volunteerism. It promotes the intellect, moral character and personal engagement of its outstanding participants as they pursue success in achievement. We provide young ladies and women with a forum to promote self esteem; compete for state and national titles; meet others with similar interests; and open doors to personal and financial opportunities! Recognized as "the premier event of its kind" and the largest pageant system? available, it promotes a "sisterhood" not found in any other pageant. When a contestant enters into the United States Pageant System, she becomes part of a whole new family, a group of sisters, not by blood, but by an amazing sorority of ladies brought together by this amazing organization. 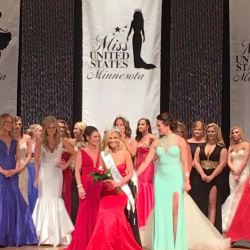 The Minnesota United States contestants are intelligent women of all walks of life, who know what they want in her career, family and appearance. They maintain a strong sense of identity and embody the true spirit of "complete and total beauty."